High over the moons of Silva Tenebris, a signal is received carrying promises of new research and resources. 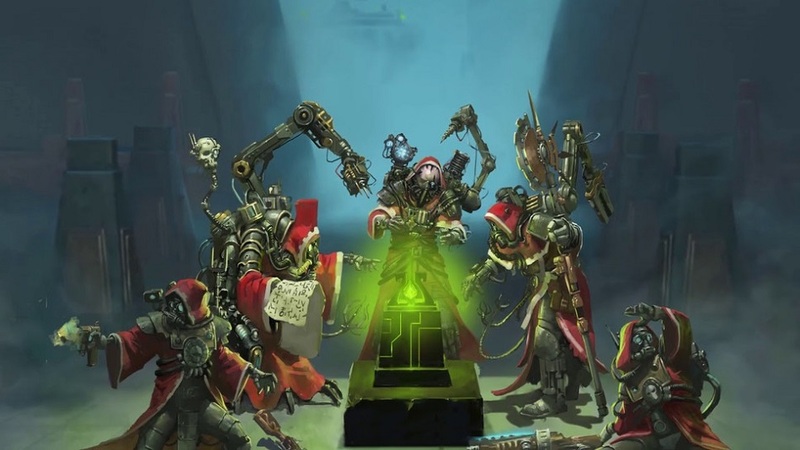 The technology-worshipping cyborg priests of the Adeptus Mechanicus hear it and decide to seek it out. While on the hunt, they uncover vile and blasphemous Necrons — skeletal cyborgs who want to escape their tombs and purge the universe of the living. Warhammer 40,000: Mechanicus is an isometric turn-based tactics title based in the worlds of Games Workshop. 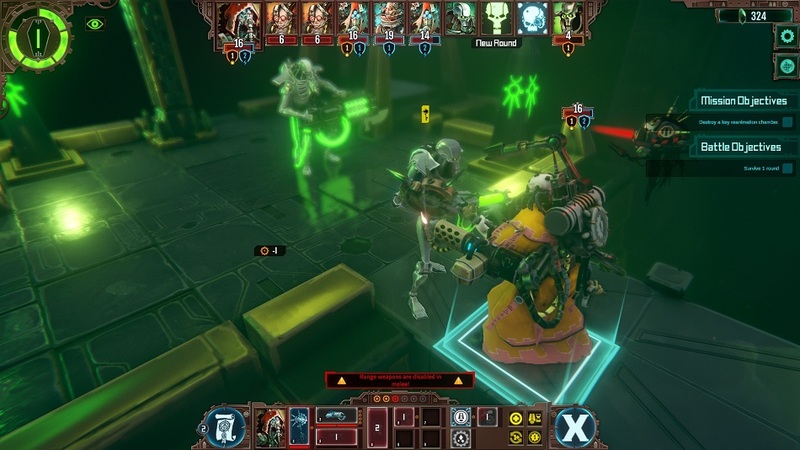 Players will control the Mechanicus and their armies of Skiratii warriors as they clear dungeons of dangerous Necron enemies and obtain resources to further improve their tech. Players choose from between two to five missions available at any time, and each has its own set of enemies, goals, and rewards for completion. Once selected, players then choose a team made up of different warriors. Skiratii soldiers are infantry units on the field, and Mech Suits can be unlocked as heavy bruiser characters. Tech priests, the main focus for players, will be a combination of the best of both. Each mission is divided into multiple rooms which gives the player a ‘choose your own adventure’ text-style prompt. Each choice can either increase a player’s resources for the rest of the mission, hurt the player’s soldiers, or strengthen the enemy. In one mission, I came across a Necron sculpture with a hieroglyphic inscription. I had the option to either observe the sculpture, attempt to translate the hieroglyphics, or destroy it. I destroyed the sculpture myself, and it caused my unit to have unsettling visions and lose morale, weakening them for the next fight. With that in mind, it’s amazing to see the humor this game has to offer. The Warhammer universe is a bit dreary, but the story beats between some of the main characters had me filled with glee. Videx, a priest figure, always preaches to destroy heresy, but in ways that are hilariously over-the-top. He starts with cautiously shooting first and asking questions later, but builds to a motto of “any doubt can be eliminated with firepower and explosions.” Scaevola, the scientist, more often wants to preserve and study the necrons. When warned of such an attitude, the response was “Error: Damn not Found”. Combat is all about location and cognition points, used to employ skills in battle. A single move and basic attacks are free of cost, but multiple movements and more powerful weaponry require cognition points. Throughout each encounter, there will be generators that players can siphon cognition points from, or they can gain cognition points from destroying enemies. 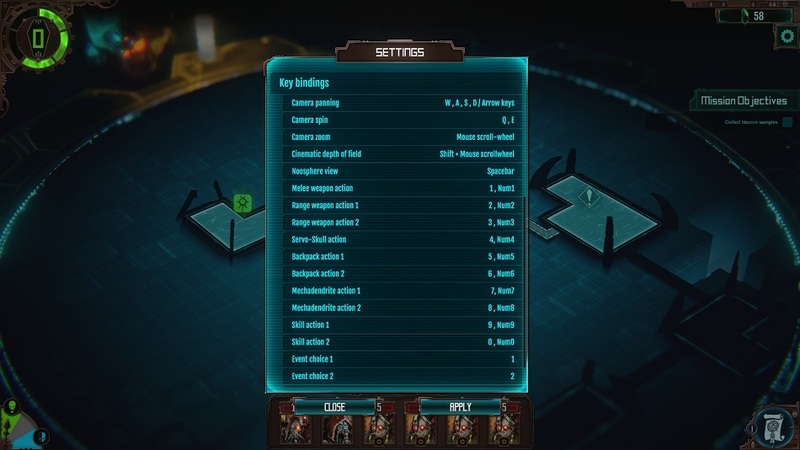 Similar to the tabletop Warhammer games, players must make sure each enemy is within weapon range and line-of-sight to be able to attack. Between missions, players will be able to use resources they’ve obtained to power up their tech priests. 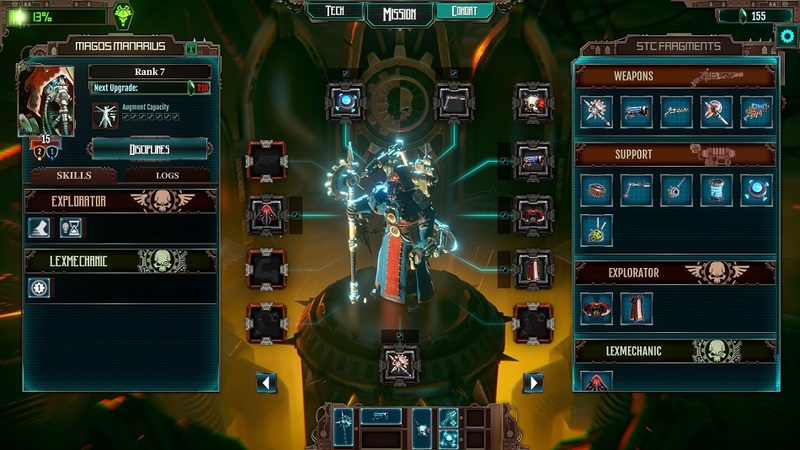 Priests have six different tech trees to choose from, each providing unique abilities and skills. As priests levels up, they’ll obtain augmentation slots which let them wield more powerful weapons and items. Players can customize each tech priest uniquely to go along with their style of play, and it ranges from simple tweaks like focusing on energy or physical weapons, but it can go deeper. One tech priest of mine was made not to fight, but more to draw the enemy away and collect cognition points for other characters during battle. 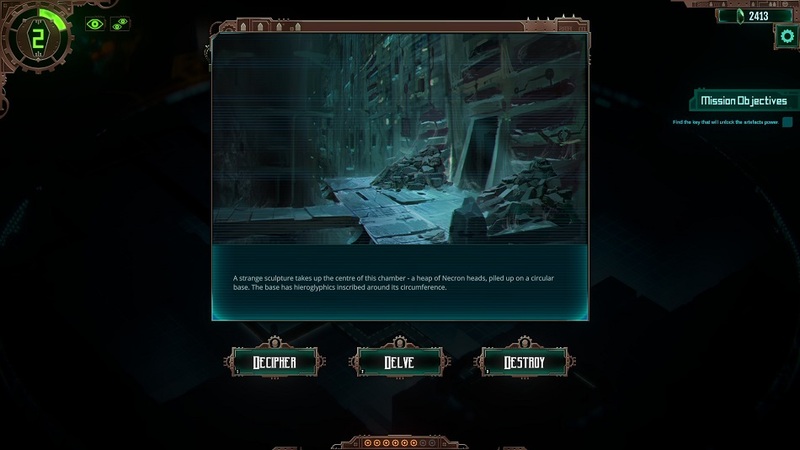 Solid gameplay, multiple customization options, and a great 40K atmosphere are sadly overshadowed by the difficulty of Mechanicus. But don’t assume it’s too hard — just the opposite. After choosing some upgrade paths for my priests I soon realized that focusing on maxing cognition generation broke the game. I quickly reached a point where I had heavy weapons and multiple options to use them for free each turn, and was able to wipe out most enemies before they could even react. Similarly, once I found this trick I realized that I didn’t need to bring other soldiers on missions because the tech priests alone were more efficient. The risk of exploring the dungeons was negated because I was so far ahead of the power curve, and with the tech priests being so powerful, the only tactic needed was to disintegrate the nearest enemies with a pulse laser as soon as possible. Parents: The game’s rating in the ESRB is currently pending according to the developer’s press kit, but in my view it contains Violence and Language. It’s not strong language, but there is a ‘damn’ here and again, but nothing too heinous. There’s a lot of shooting and death, but characters mostly explode into pixels and not blood. Teenage audiences and up advised. Deaf & Hard of Hearing Gamers: All text in the game are done through text boxes, but none of the text boxes are resizable. Remappable Controls: Controls are completely remappable.